“Hajj” is an annual Islamic pilgrimage to Mecca & the fifth of the five obligatory of Islam. It’s also known as the “Fifth pillar of Islam“. “Hajj” is a scared duty that’s mandatory for every Muslim who is capable to arrange the means for it. Every year, millions of Muslims gather in Mecca from around the world. It’s a largest mass gathering in all mankind. On this event Muslims ask Allah for forgiveness. 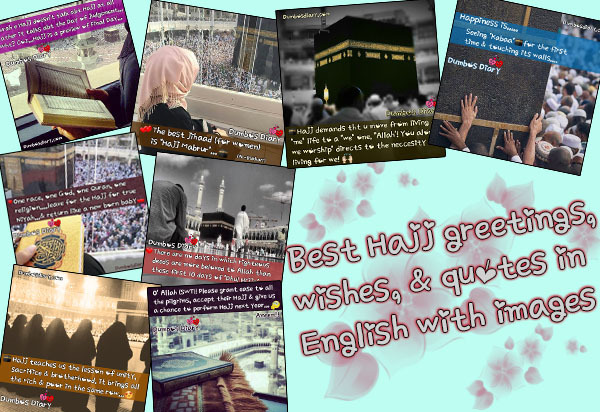 Here I’m sharing best Hajj greetings, messages, wishes & quotes in English with images. Share these Hajj greetings, quotes wishes or messages with your friends. These images will help you wishing Hajj to your friends, friends, acquaintance or colleagues. Fasting “the day of Arafah” & having the sins of the past year & the coming year forgiven. Hajj demands that you move from living a “me” life to a “we” one. “Allah’! You alone we worship” directs to the necessity of living for we! Seeing “Kabaa” for the first time & touching Its walls. O’ Allah (SWT)! Please grant ease to all the pilgrims, accept their Hajj & give us a chance to perform Hajj next year. Aameen!! “Hajj” teaches us the lesson of unity, sacrifice & brotherhood. It brings all the rich & poor in the same row. The best “Jihaad” (for women) is “Hajj Mabrur“. “Surah e Hajj” doesn’t talk about “Hajj” at all. Rather it talks about the “Day of judgement“. Why? Because “Hajj” is a preview of “Final Day“. Here I’m at Thy service O’ Lord, here I’m. Here I’m at Thy service & Thou hast no partners. Thine alone is All praise & all Bounty.